Next up in my spotlight series on the current ebook bundle of winners and finalists for Canada's premier speculative fiction award, the Aurora Award, is Jayne Barnard with Maddie Hatter and the Deadly Diamond. 1. Who is your favourite character in this book and why? Lady Sarah. She’s a Becky Sharp, a woman making her way up in the world through application of wit, charm, guile, and a few well-chosen aliases. She’s a lot of fun to write, and I thoroughly enjoyed sampling her continued adventuring in the third book, ‘Maddie Hatter and the Timely Taffeta’ (Tyche Books, October 2017). 2. What's your favourite relationship between two characters in this book and why? I most admire – even envy – the relationship between Maddie and her mentor, Madame Taxus-Hemlock. While she has Maddie’s best interests at heart and helps her out when she’s stuck, Madame’s not an enabler. She supports Maddie’s strengths, empowering her with the skills and resources she needs to tackle challenges for herself. Mentoring is a vital relationship in business and in life, and women need greater familiarity with both sides of it. 3. What's your favourite scene in this book and why? The ‘all suspects in the drawing room’ scene. Partly because it’s set in an isolated manor house on a Cornish moor - a trope I happily parodied from Gothic romances - and party because it’s a cliché of detective fiction that lends itself to up-ending. Like his better-known counterpart in the mustache-laden detective field, Hercule Hornblower attempts to manipulate and browbeat confessions out of each suspect in turn, but nothing in Maddie’s world works out the way it’s expected to, and so of course this scene doesn’t either. 4. Did you know you were writing a series when you first began this book, or did the idea of a series grow from the telling of this book? The series grew out of this book. I had such fun with the characters - their improbable names, their gadgets, their dubious ethics – that I wasn’t ready to let them (most of them) go happily off into the New York sunset after all their adventures. When I started the second book, my publisher and I knew it would be a five-book series, each one a complete adventure that can stand on its own and yet, when taken all together, forming a single over-arching story of Maddie’s growth from a reckless adolescent to a respected professional in her Jules-Verne-meets-Indiana-Jones world. 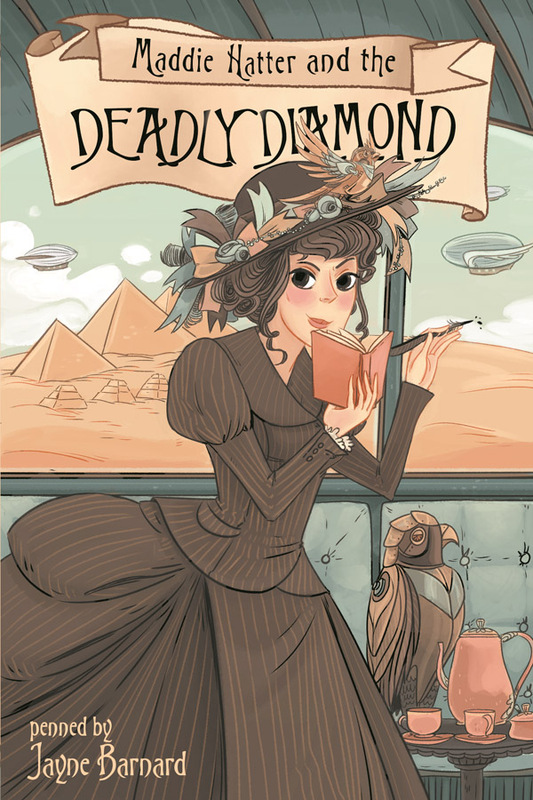 Jayne Barnard is a founding member of Madame Saffron's Parasol Dueling League for Steampunk Ladies and the author of the Aurora-nominated Maddie Hatter Adventures. Her crime stories, set anywhere from the real past to several alternate futures, have seen print and prizes across Canada. Fuelled by love of the wild, she's at work on a trilogy of mystery novels set in the forested foothills of the Rockies. The first, When the Flood Falls, won the Dundurn Unhanged Arthur in 2016 and is slated for release in 2018. She divides her writing year between Calgary, Alberta with an orange cat, and the rocky shore of Vancouver Island, where her only regular companion is an owl. Check out the bundle here for more information and details on each of the included titles. And remember, it's available for a very limited time only, from now until November 30 at midnight.